Find peace, purpose, and your authentic voice. Learn to live with more ease, whether you have a diagnosed anxiety disorder, or just experience everyday stress. 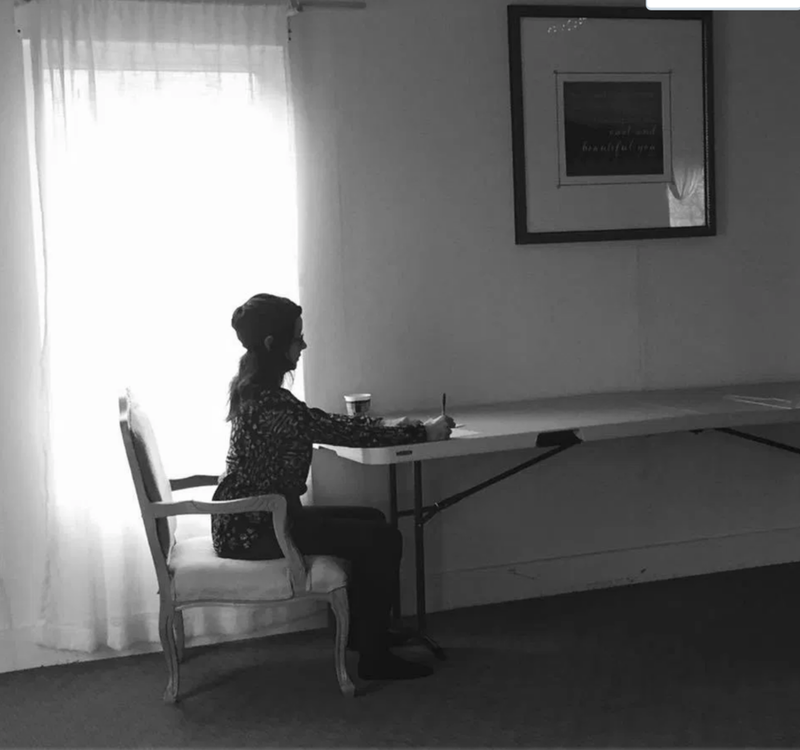 Prose & Pose Workshops balance creative writing, mindful meditation, and the physical/philosophical practice of yoga. 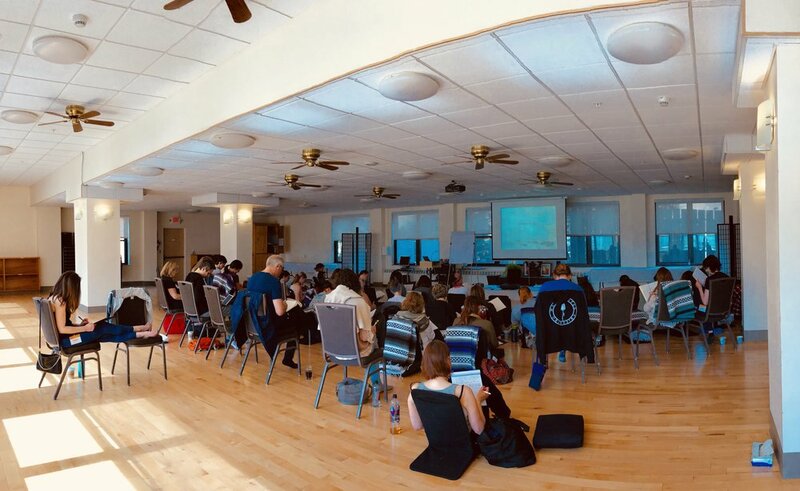 Explore the mind/body connections involved in creative writing and yoga asana practice, while learning tools to help manage anxiety and depression. We will discuss ways to move deeper into your writing, access your authentic voice on the page, and deal with the inner critic. We will engage the body and learn how a meditation practice can help access an inner stillness that supports any creative project. Workshops are held all over the country and range from four hours to four days. 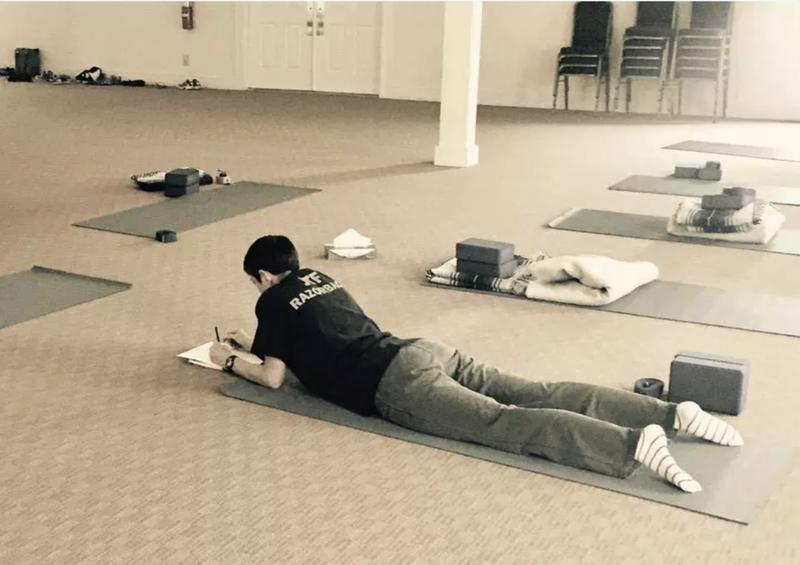 Beginners to both yoga and writing are enthusiastically welcomed! If you would like to request a retreat for your school or organization, click here. For a list of upcoming retreats and events - check the sidebar or click here. A portion of the proceeds from all Prose & Pose workshops goes to support the work I do with Expedition Balance, a non-profit organization committed to helping combat Veterans with post-traumatic stress regain their lives through yoga, mindfulness, hiking, therapeutic writing, and other community-building activities. Learn to live with more ease and authenticity, whether you have diagnosed anxiety/depression, or just experience everyday stress. Author, yoga/meditation teacher — and life-long anxious person — Lisa Jakub will discuss tangible ways to understand your inner critic, increase compassion for yourself and others, and access the joy within that often feels smothered by stress. 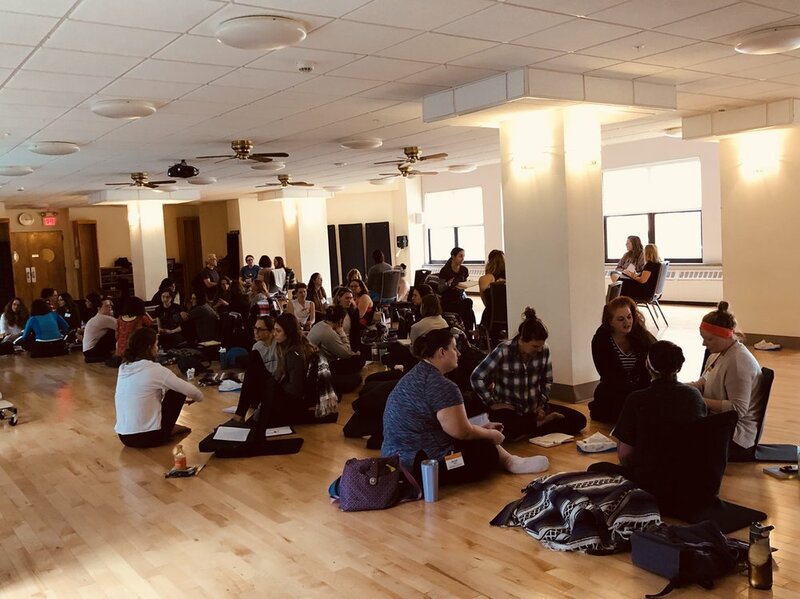 The class will also include therapeutic writing exercises, breathing techniques, and mindful group dialogues about managing anxiety. We will practice proven methods to retrain the brain and create healthier habits in all areas of our lives. This fun and engaging class provides opportunities (but no obligations!) to share your creative work in a supportive community, ask questions, and gather tools to create more happiness and contentment in daily life. No experience in anything, other than being human, is required. Join the class via video conference with free and easily downloadable Zoom software from anywhere you have an internet connection. Questions? Ask here. Veteran discount and a limited number of other scholarships are available, inquire here. Learn to live with more ease and authenticity, whether you have a diagnosed anxiety disorder, or just experience everyday stress. This experiential program includes yoga asana practice, meditation, writing exercises, and mindful group dialogues about managing anxiety. Both yoga and writing are ways of getting to the heart of the moment and seeing what is true and real in everyday life. The key to more inner peace lies in learning to drop the story and access the serenity of the present moment so we can stop obsessing about the past and future. For those of us with anxiety, that seems like an impossible task, but there are proven ways to re-train the brain and create healthier habits. This fun and engaging weekend provides opportunities (but no obligations!) to share your creative work in a supportive community, and return home with tools to create more happiness and contentment in daily life. Author, yoga teacher, and life-long anxious person Lisa Jakub will discuss tangible ways to understand your inner critic, increase compassion for yourself and others, and access the joy within that often feels smothered by stress. “Someone already mentioned how “up” and positive I sounded coming home after your workshop this past weekend! I am a 200hr Kripalu certified yoga teacher (in the process of getting my 500hr certification) and I am deeply passionate about sharing the practice of yoga. I teach individual classes, and lead yoga workshops all over the country, for everyone from beginners to experienced yogis. I love teaching because many people feel intimidated by yoga, with all those bendy people in stretchy pants. I get it. I was terrified to go to my first class. I have anxiety and a panic disorder and I couldn’t even touch my toes. What the hell was I doing in a yoga class? But yoga turned my life upside down in the best possible way. It offered me tools to manage my anxiety, depression and panic attacks. It cured the pain and lingering nerve damage I suffered from a broken back. It showed me a more peaceful and mindful way to live my life. I’ve now had a devoted practice for more than eight years and I love helping others discover the wide range of physical and emotional benefits that come from yoga. My very first yoga student was my grandmother after her stroke — so those who are not traditional “yoga types” have a special place in my heart. If you can breathe, you can do yoga. My training in Kripalu yoga has a strong focus on breath/body awareness and is very permissive, with lots of variations and modifications. 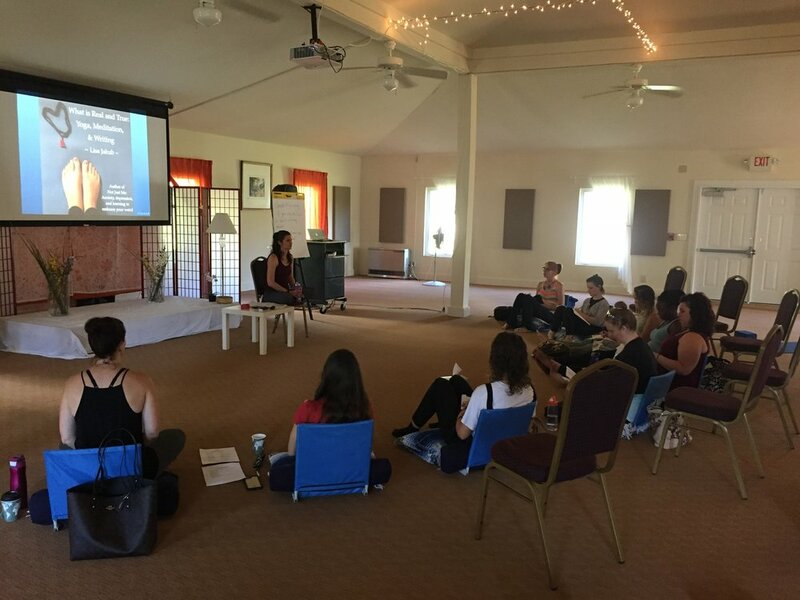 I have experience teaching trauma-informed yoga for those who are struggling with the effects of a stressful event or PTSD, as well as those who have significant physical limitations. 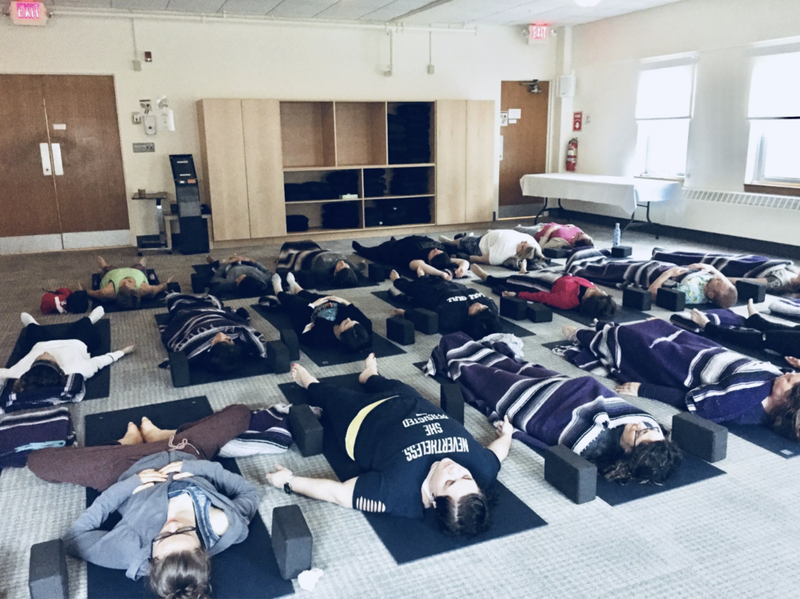 I have studied Vinyasa yoga, Yoga Nidra, and traditional yoga philosophy — all of which help inform my personal teaching style. My belief is that yoga is grounded in love, self-acceptance, and presence. Everything else is a side-effect. In the chaos of everyday life, it can feel impossible to find some peace. People tell me all the time that they can’t meditate — they tried it and their minds are spinning wildly and they can’t stop their thoughts. I’m sorry to break this to you because I’m sure you are an absolutely delightful person: but your brain is not special. It’s not. That is what everyone’s brain does. It’s your brain’s job to always look for problems. That’s how it has kept you alive. Saying you can’t meditate because you can’t stop your thoughts is like saying you can’t play basketball because you aren’t a unicorn. Of course you are not a unicorn and of course, you can’t stop your thoughts. Luckily, we’re not trying to stop our thoughts when we meditate. We’re just trying to shift our relationship with them and realize those manic thoughts don’t have to run our whole damn lives. Meditation was an absolute game-changer for me – it helped me get a handle on my anxiety and depression, and I believe it can help everyone. It’s not woo-woo hippie stuff. It’s science. In these classes, I teach the tools of meditation and mindfulness to help manage anxiety, mood disorders, and everyday stress. For a beginner’s guided meditation I recorded in my closet, click here. Or find my meditations on the free Insight Timer App.